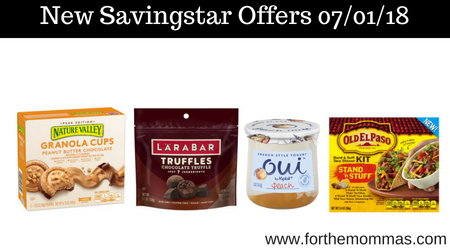 There are 23 new Grocery offers from SavingStar available from today. You can save up to $21 on Hershey’s, Nature Valley, Larabar and More. Save $3.00 when you spend $15.00 on any NestFresh Eggs products..Expires 9/9/2018.Save $3.00. Save $4.00 when you spend $15.00 on any ZonePerfect® Products..Expires 8/26/2018.Save $4.00. Save 50¢ when you buy ONE BOX 6 COUNT (1) Hershey’s™ Pillsbury™ Toaster Strudel™ pastries..Expires 7/31/2018.Save $0.50. Save 75¢ when you buy ONE (1) PACKAGE any flavor Totino’s™ Pizza Rolls™ Mini Snack Bites..Expires 7/31/2018.Save $0.75. Save $1.00 when you buy FOUR (4) PACKAGES any flavor/variety Betty Crocker™ Suddenly Salad™ OR Helper™ products..Expires 7/31/2018.Save $1.00. Save 50¢ when you buy any ONE (1) Old El Paso™ Taco Boats™ Dinner Kit OR Taco Boats™ Flour Tortillas..Expires 7/31/2018.Save $0.50. Save 50¢ when you buy FIVE (5) CUPS any variety Yoplait® Yogurt. (Includes Original, Light, Light Thick & Creamy, Thick & Creamy, Whips!®, OR Lactose Free. ).Expires 7/31/2018.Save $0.50. Save 25¢ when you buy ONE (1) CUP any variety Yoplait® Mix-Ins..Expires 7/31/2018.Save $0.25. Save 30¢ when you buy ONE (1) JAR any variety Oui™ by Yoplait® French-style yogurt..Expires 7/31/2018.Save $0.30. Save $1.00 when you buy TWO (2) CUPS any flavor Liberté® organic yogurt..Expires 7/31/2018.Save $1.00. Save 25¢ when you buy ONE (1) CUP any variety Yoplait® FruitSide..Expires 7/31/2018.Save $0.25. Save 50¢ when you buy TWO (2) BAGS any 3.7 OZ. OR LARGER Chex Mix™, Chex Mix™ Muddy Buddies™, Chex Mix™ Popped™, Bugles™ Corn Snacks, OR Gardetto’s™ Snack Mix..Expires 7/31/2018.Save $0.50. Save $1.00 when you buy ONE (1) any flavor/variety 5.5 OZ OR LARGER Food Should Taste Good™ Tortilla Chips OR Bean Chips..Expires 7/31/2018.Save $1.00. Save 50¢ when you buy ONE (1) BOX any flavor/variety 5 COUNT OR LARGER Nature Valley™ Granola Cups, Nature Valley™ Layered Granola Bars OR Nature Valley™ Granola Bites Pouch..Expires 7/31/2018.Save $0.50. Save $1.00 when you buy TWO (2) BARS any flavor EPIC® Performance Bar..Expires 7/31/2018.Save $1.00. Save $1.00 when you buy ONE (1) BOX any flavor EPIC® Performance Bar multipack..Expires 7/31/2018.Save $1.00. Save 75¢ when you buy ONE (1) any flavor LÄRABAR™ multipack OR LÄRABAR™ Truffles..Expires 7/31/2018.Save $0.75. Save $1.00 when you buy ONE (1) BOX any flavor LÄRABAR™ Kid Brownie..Expires 7/31/2018.Save $1.00. Save $1.00 when you buy ONE (1) any flavor Yoplait® Yogurt 8-Pack Fridge Pack..Expires 7/31/2018.Save $1.00. Save 50¢ when you buy ONE (1) BOX Old El Paso™ Crispy Flour Tortilla Shells OR Stand ‘n Stuff™ Hint of Lime Tortilla Shells..Expires 7/31/2018.Save $0.50.